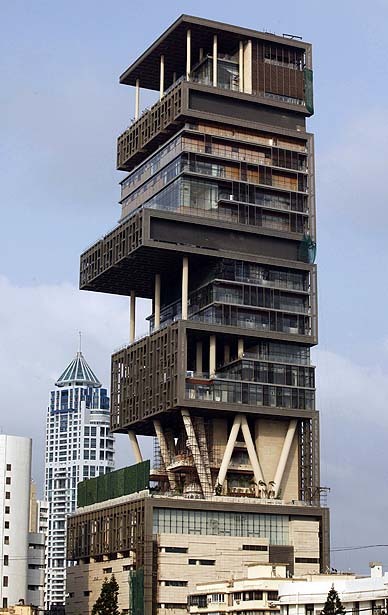 Most expensive house in the world – wasteful or lavish self-indulgence? Is such lavish display of wealth necessary and sustainable? The Guardian recently reported Indian Prime Minister Mr. Manmohan Singh calling on business leaders to “eschew conspicuous consumption” and “be role models of moderation.” Reactions to the house have been mixed as how much Mr. Ambani spends on his house for himself and his family should not be anyones business as that is truly subjective. But many people also feel that an expensive house like that in a city where millions live in slums without basic amenities is a criminal offence. Antillia definitely puts Mumbai on the map of expensive homes but are we proud of this achievement? Read the full article here: Most expensive house in the world – wasteful or lavish self-indulgence? This entry was posted in Culture, Design, Indian Art and Architecture, Travel and tagged Architect, Architecture, Bombay, building, Charles Correa, Culture, Design, Forbes, growth, India, Mukesh Ambani, Mumbai, Reliance Industries, Travel. Bookmark the permalink. 4 Responses to Most expensive house in the world – wasteful or lavish self-indulgence? Mr A M Elephant( lol…I like that name!) well there is a class difference in every city of the world…some are not so well off and some are well off. so the argument of showing a display of wealth when the city is full of slums is redundant. I feel if someone is enjoying his money, one should leave him alone. From the standpoint of it casting a huge shadow and eating up the sunlight and causing unnecessary traffic congestion, yes then the building is a potential nuisance. I don’t disagree like I said that how someone chooses to spend their money is subjective but being in a position like that and looking to build an iconic structure one must not compromise on cultural context. Many cities in China and India are building iconic structures that disregard the culture and climatic conditions and are just blindly aping the west. What we build new should definitely transform our cities but build upon and add value to our existing lifestyles, environmental and cultural conditions.